McMinnville, OR, January 8th, 2018. The Wineries of the McMinnville Winegrowers Association banded together and recently collected all of their Veteran’s Day Weekend tasting fees to present a total donation of $1,428 to McMinnville Habitat for Humanity. 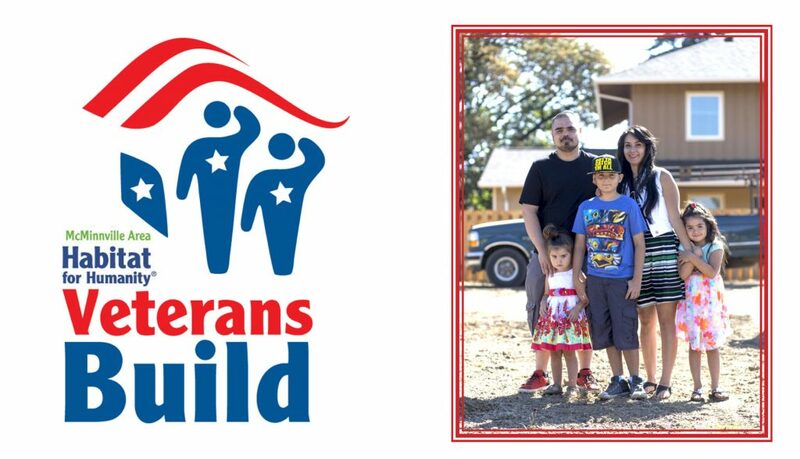 These funds are dedicated to their Veterans Build project and will bring Ed Floyd, a US Army veteran, and his wife and three children one step closer to their dream of owning their own home. “McMinnville Area Habitat for Humanity is extremely grateful for the generosity of the McMinnville AVA”, said Mary Stern, the Executive Director for the McMinnville Habitat for Humanity. “Because of assistance from these terrific wineries and many other local donors, MacHabitat anticipates the Floyds will move out of substandard housing and into their new home this April. Cheers to you, McMinnville AVA!”. Scott Neal, President of the McMinnville Winegrowers Association states, “The Oregon spirit has always been to work together to build a better industry and community and we are honored to make this donation. We are thankful to Mr. Floyd and his family for the service he has provided our country and look forward to welcoming them to their new home”. McMinnville Winegrowers Association is a member driven organization dedicated to increasing the awareness of the wines and wineries from the McMinnville American Viticulture Area (AVA). The vineyards and wineries of the AVA lie west of the town of McMinnville, Oregon, amongst the rolling coast range foothills. The unique geology, climate and geography of this region allow our winegrowers to consistently produce world-class Pinot Noir, Pinot Gris, Chardonnay, Riesling and Pinot Blanc along with some other unique varietals of wine.